● Free shipping is available for all orders delivered within the continental US worth at least $50. A flat rate of $49 is available for orders less than $50. 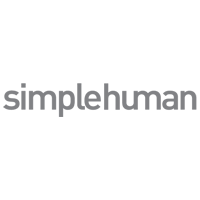 ● SimpleHuman offers free return shipping for unused items within 45 days of purchase. ● The online store ensures it offers the best prices on its products through its Price Match Guarantee. If you find a lower price for the same item at another retailer, you can request for an adjustment good for up 30 days after the original purchase date. Simple Human focuses on maximizing the convenience that their shoppers experience from using their products. Most of their household items incorporate some type of technology to make them more useful. For example, self-opening and closing garbage cans, fingerprint-proof materials, and more. On the home page of their website you can take a look at the trash cans, soap pumps, sensor mirrors, kitchen tools, and bathroom tools that they have available. They offer sales throughout the year and they will either be advertised through their newsletter or on the home page of their site. You can also view their newest and most popular items on the front page of their site. For most up to date offers check out Simplehuman on Facebook and Twitter or contact Simplehuman Support for any questions.